Tankless Water Heaters LTD.com is a wholesaler and reseller of high quality natural gas and LP gas tankless water heaters and their parts. 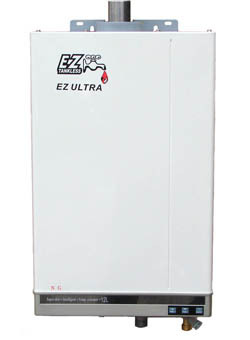 The EZ-ULTRA is the latest in high efficiency direct vent computer temperature controlled high output tankless technology. This compact direct-vent-forced-air unit makes big BTUs in a small package. Low exhaust pipe temperatures and direct vent intake make this unit safe and economical. With direct vent, intake combustion air is drawn in from outdoors. This eliminates the backdraft dangers and room Cubic Feet requirements of many models of the past. * Additional concentric intake-exhaust extension components available at minimal cost. Dimensions 24" x 15" x 5"
Packaging Size 30" x 17" x 9"
We ship by FedEX Home Delivery or Freight Carrier usually on the same day you order! Place your order with confidence online by using our secure Paypal shopping cart.